This exquisite Mothers Day bouquet of autumn flowering blooms features stunning blue delphinium, exotic cymbidium orchids, ornamental cabbage flowers, velvety celosia and textural foliage. 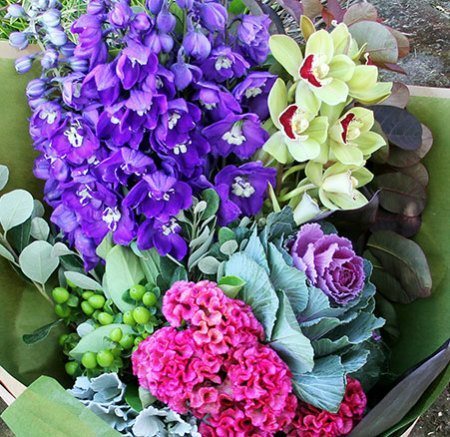 Modern Mothers Day flowers for a modern, fun loving mum! Send as they are, or team with a box of chocolates, a scented candle, perfume reed diffuser, or a bottle of wine from our gift range for an extra special Mothers Day pressie. Buy mum flowers online or give the team a call toll free on 1800 66 66 46. 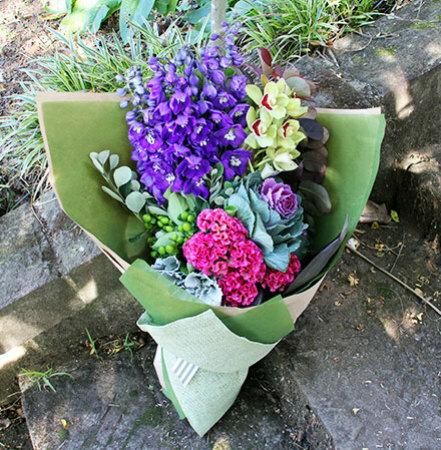 *Please note: The pictured Mothers Day bouquet and presentation is exclusive to Sydney flower delivery only. For flowers delivered elsewhere in Australia, the team will coordinate your blooms with an affiliate florist network to recreate our style and content as closely as possible.